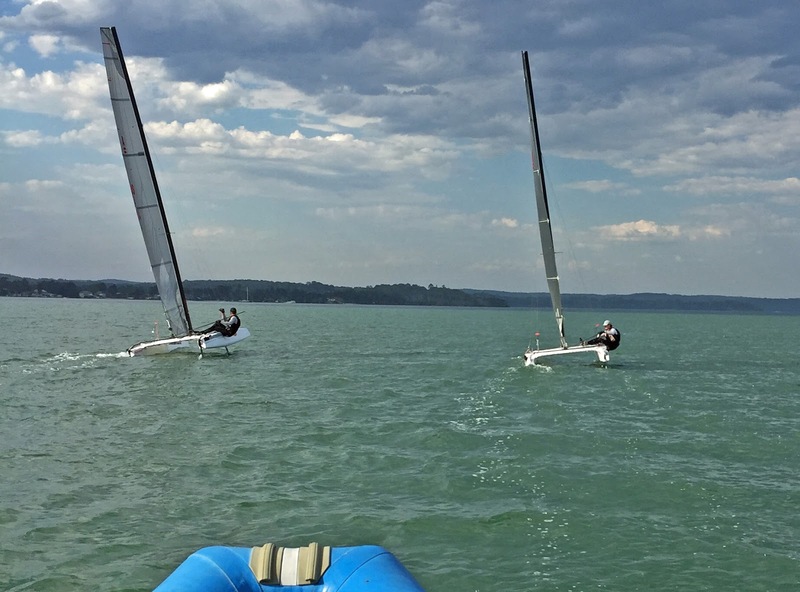 Nice background story sent by Aussie Skiff/A-Cat sailor Simon Nelson on the path the Aussie camp towards the A-Class Worlds held at Sopot two weeks ago where Steve Brewin obtained the crown over a super competitive fleet and challenging weather conditions. "That Stevie Brewin dominated the 2017 A Class Worlds is now well known. Brewin has sailed A’s for many years and is now a 3 time World Champion, a feat only bettered by Glenn Ashby. While Australia has always been a stronghold for the class, Brewin has managed to reach this position of dominance despite having little race time and few events in which to test himself against the main contenders. So how has he managed to produce such a performance? While his sail making business leads people to believe he is a professional sailor, Brewin earns his living as a builder, working a full week on site. 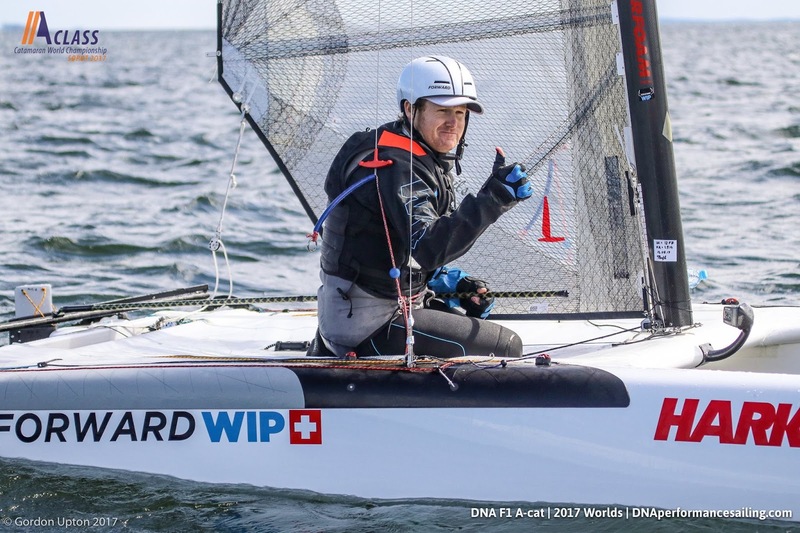 His sail making is done in the early mornings, late evenings and weekends, meaning his sailing is limited to weekends, so he certainly didn’t gain his edge by sailing more than his competitors, some of who spent weeks and months at the Worlds venue training close to full time. 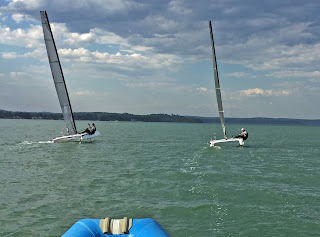 The group also had visits from other local A Class sailors, such as Scott Anderson of Fiberfoam (Olympic Bronze medallist and past A Class World Champion). For the most part, Brewin and Bundock were a step, sometimes waiting for the others to catch up for extended periods, the price paid for the company of friends on what were sometimes long and cold days. After a dominant 1st and 2nd at the Australian Nationals at the beginning of the year, focus switched to the Worlds. As main testers of new equipment for Exploder, there was a slow but steady supply of foils to try and feedback to give while at the same time, Brewin attempted to develop a new rig that lowered the centre of effort by lowering the mast height. A broken mast was rebuilt to a shorter length and a new design of sail was made. With 2 similar boats, Brewin and Bundock carefully compared foils and rigs, swapping boats to check the findings. Throughout, there was a competitive edge as each pushed harder, trying to outdo the other both when sailing next to each other but also when looking at GPS speeds and tracks. New systems were also tested and in particular, the under tramp mainsheet was perfected with the help of Grant Pellew from Harken Aus. This led to a much tidier boat and a mainsheet that was easier to play than the previous F18 based traveller mounted blocks. During this period, with constant help from the team’s senior members, the others were improving, giving alternative benchmarks. This proved important when Bundock headed off to Europe 6 weeks before Brewin and allowed for continued meaningful development. After showing initial promise, the short rig was as good as dismissed by the middle of March. 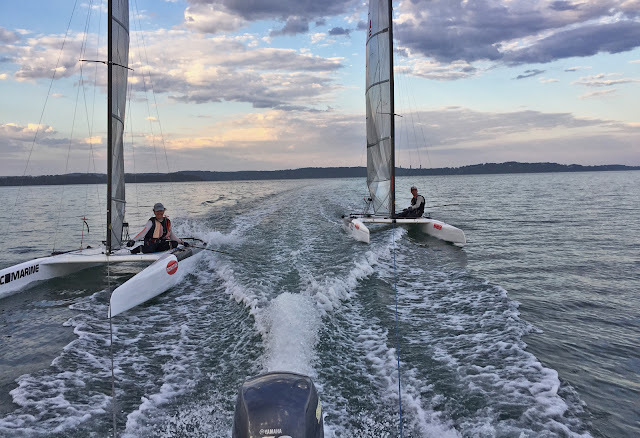 However, Brewin wanted to sail the Queensland State titles and found himself with only the short rig, having sold his big rig sail, so he used it to win comfortably. Soon after, Bundock achieved new top speeds both upwind and downwind using short rig, so interest was renewed. The sail was redesigned and more testing ensued. The new sail was a big improvement and was easier to use, but there was always a question of performance in light winds, not helped by the lack of such conditions. As is typical of Sydney in winter, winds were often either too light to sail or windy. 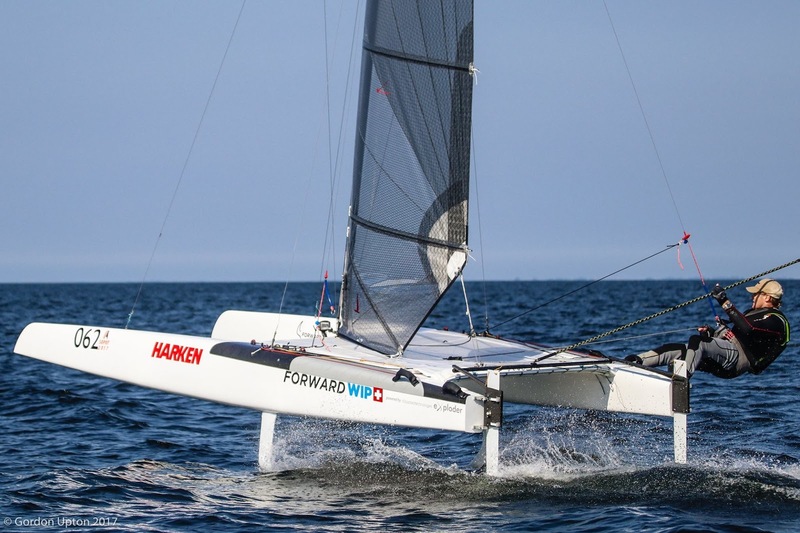 By the time Bundock left for Europe, they were confident of their upwind foiling speeds and the short rig was looking promising. There were still issues, particularly around battens, because what worked in 12 knots didn’t work in marginal foiling conditions. This issue and the arrival of new rudders kept Brewin sailing hard over the coldest of the winter, now being pushed by Johno and myself (Simon showed great speed in certain situations). When Bundock left it was felt that they were ready for the worlds, but the additional time Brewin had to spend testing the short rig and new rudders gave an opportunity to shift the focus of training from outright foiling speed and early foiling to transitioning between modes and understanding when each mode would pay. Most of the training had been done on relatively flat water. On arriving in Europe, Bundock reported that windy conditions at the race venue led to “Southern Ocean” like waves. Brewin had to rely on arriving a week early and training at the venue to learn the waves. 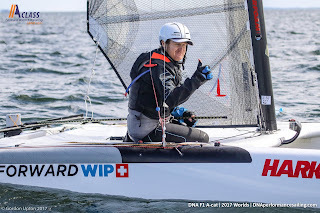 As luck would have it, there were no real waves until the second day of the worlds racing, but the light winds pre-worlds regatta gave an opportunity to evaluate the short rig against the fleet, with Brewin sailing 2 days with the short rig and 1 day with the tall rig. With a forecast that included light conditions and no more time to test the short rig, the decision was made to race with the tall rig even though he hadn’t sailed with it for some 6 weeks. All the training that had previously been done was to pay off as he made the switch with no problems. Brewin has been very open with the view that above 14 knots the short rig is quicker and it seems likely that in the conditions of the second day, when the “Southern Ocean” returned to Sopot, the short rig would have enabled him to improve on his worst results, a 4th and 5th. How he might have gone in the lighter conditions with the short rig is something we will never know. A final point worth noting is that besides managing his own campaign and organizing his new boat, Brewin also went to a lot of trouble to assist a contingent of Australian sailors who also got new Exploders for the event, making sure they got the latest boats with the latest foils and he shared his ideas on fit out. He supplied tramps, sails and custom systems such as the under tramp mainsheet system. Without his help, these boats would never have been as good as they were and it would have been significantly more difficult for the rest of the Australians. What could easily have been a distraction at the time he needed to be thinking of his own worlds effort he handled in his stride and is just one of the reasons why Brewin was such a popular and great Champ"
Report written & sent by Simon Nelson.